Members of the Maine Human Rights Commission listen to testimony during a hearing about religious discrimination accusations filed against Moody's Diner by an employee in Augusta in this November 2014 file photo. On Monday, the rights panel denied a request from Gov. Paul LePage to reconsider its ruling. AUGUSTA, Maine — The Maine Human Rights Commission on Monday denied a request from Gov. Paul LePage to reconsider its ruling that Moody’s Diner, a destination restaurant in Waldoboro, discriminated against a former employee for religious reasons. The commission ruled in November 2014 that “reasonable grounds” exist to believe discrimination by Dan Beck, a co-owner of the restaurant, starting in 2012, had resulted in a hostile work environment for an employee, Allina Diaz, and that the restaurant had retaliated against her after she filed a complaint with the rights commission. Since then, Beck and the restaurant have lobbied lawmakers and LePage in an effort to clear their name. Most of the effort has focused on an audio recording between Beck, Diaz and Beck’s son, whom Diaz was dating at the time of the alleged discrimination. LePage urged the commission to reopen the case and consider the entire recording. Beck and his attorney have said the full recording would prove that religious disagreements were not at play. The snippets were presented along with other evidence, which indicated that Beck did not approve of his son’s relationship with Diaz for religious reasons. Beck is a devout Presbyterian, and in the report the Human Rights Commission’s investigator described several instances of Beck or his wife — who does not work at the restaurant — making disparaging comments to Diaz, including that she and their son were “not following Jesus” by continuing their relationship. Commissioners were not swayed by the governor. They indicated that if the full audio was necessary to make a fair judgment, as Moody’s claims, it should have been submitted as evidence while the case was still open. “The parties’ submissions are discussing an audiotape that both parties had, that neither party submitted to the investigator during the investigation,” said commission Chairman Arnold Clark. Diaz is no longer an employee of the restaurant, and she and Beck’s son have since broken up. As first reported by Maine Center for Public Interest Reporting, LePage stepped into the process after the Human Rights Commission ruled in Diaz’s favor, while the commission was attempting to mediate a settlement. According to a memo by Human Rights Commission executive director Amy Sneirson, LePage asked that a mediation meeting be postponed while his office looked into the case, and threatened further action if his request wasn’t granted. 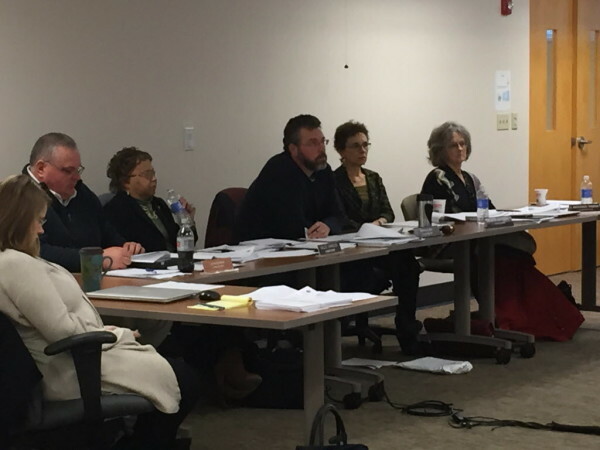 The commission declined to postpone the hearing, and LePage responded by denying the commission a routine $4,000 expenditure to pay for temporary staffing. Sneirson has said the commission’s work has not been jeopardized by the lack of funding. In a memo distributed to commissioners on March 17, Sneirson decried LePage’s attempts to intervene in the panel’s work. “The commission is a quasi-independent agency and is supposed to be immune from the sort of politicking that has happened in this case,” she said in the memo. The Human Rights Commission’s attempt to mediate an out-of-court settlement between Diaz and the restaurant failed on Feb. 10. At that point, the panel could have decided to take Moody’s to court, but the five-member commission voted Monday against taking any further action. However, with the panel’s original finding in hand, an attorney for Diaz said her client intends to sue the restaurant — but not in Maine. “We’ll be filing in federal court, out of reach of Maine politicians,” said Rebecca Webber, Diaz’s lawyer.